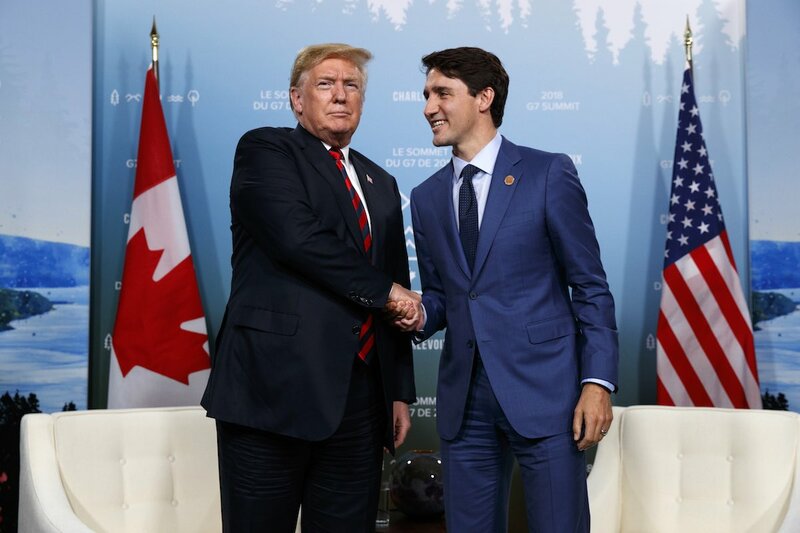 By Manuela Tobias on Monday, June 11th, 2018 at 12:34 p.m.
President Donald Trump meets with Canadian Prime Minister Justin Trudeau, whom he later accused of making "false statements," during the G-7 summit on June 8, 2018. In two fuming tweets fired aboard Air Force One upon his departure from the Group of 7 summit, President Donald Trump accused the host, Canadian prime minister Justin Trudeau, of lying. "Based on Justin’s false statements at his news conference, and the fact that Canada is charging massive Tariffs to our U.S. farmers, workers and companies, I have instructed our U.S. Reps not to endorse the Communique as we look at Tariffs on automobiles flooding the U.S. Market!" Trump tweeted. "PM Justin Trudeau of Canada acted so meek and mild during our @G7 meetings only to give a news conference after I left saying that, ‘US Tariffs were kind of insulting’ and he ‘will not be pushed around.’ Very dishonest & weak. Our Tariffs are in response to his of 270% on dairy!" Trump again tweeted. We wondered what Trudeau had done to make Trump angry. As it turns out, Trudeau was responding to a reporter’s question about U.S.-imposed steel tariffs during a press conference at the conclusion of the G7 summit. During the press conference, Trudeau called the meeting a success but pledged to retaliate against American tariffs. For context, Trump slapped hefty tariffs on steel and aluminum products on his G7 allies before the summit. Reporter: "Hi there Prime Minister. I’m wondering if you can answer this in English and in French. We have not yet seen the communiqué, but we’re told by credible sources, such as Chancellor Merkel, that you have reached compromise language on trade and tariffs in this. I’m wondering, though, if you could square that with the comments that President Trump made as he was leaving, that the U.S. has been taken advantage of for decades. We are like the piggy bank that everybody is robbing and that ends, and two, specific threats that it has to stop or we will stop trading with them, ‘them’ being people that don’t align their trade practices with U.S. interests, and warning that if you retaliate against steel and aluminum tariffs, you’ll be making a mistake. "So, my question is, how meaningful is this consensus if the president is making these kinds of threats on his way out of town?" Trudeau: "The president will continue to say what he says at various occasions. What we did this weekend was come together, roll up our sleeves and figure out consensus language that we could all agree to on a broad range of issues, whether it’s making an economy that works for everyone, ensuring the inclusion of women and girls, being bold in protecting our environment, or moving forward in a meaningful way to prepare for the jobs of the future. These are the kinds of things that are common challenges across our countries and around the world where anxiety about economic prospects of individuals and particularly of their kids leads to unpredictability and sometimes political uncertainty. We have come together to lay out where we agree, to highlight the need to continue to work together to serve the citizens who elected us. I’m very pleased we came together on an ambitious joint communiqué at the end of this Charlevoix summit." Reporter: "Prime Minister, a follow-up, though, on the two sort of specific threats from the president today, saying that he would cut off trade with countries that don’t do what the Americans want them to do, and that if you retaliate on steel tariffs, as you plan to do on July 1, that you’re making a mistake. So, how seriously do you take that threat and does that change your plans to go ahead with the retaliatory tariffs?" Trudeau: "I highlighted directly to the president that Canadians did not take it lightly that the United States has moved forward with significant tariffs on our steel and aluminum industry, particularly did not take lightly the fact that it’s based on a national security reason that for Canadians, who either themselves or whose parents or community members have stood shoulder-to-shoulder with American soldiers in far off lands and conflicts from the First World War onwards, that it’s kind of insulting. And highlighted that it was not helping in our renegotiation of NAFTA and that it would be with regret, but it would be with absolute certainty and firmness that we move forward with retaliatory measures on July 1, applying equivalent tariffs to the ones that the Americans have unjustly applied to us. "I have made it very clear to the president that it is not something we relish doing, but it is something that we absolutely will do, because Canadians, we’re polite, we’re reasonable, but we also will not be pushed around." White House economic adviser Larry Kudlow explained on CBS’ Face the Nation that Trudeau’s comments had inspired Trump’s fury. "So, he holds a press conference," Kudlow said of Trudeau. "The president is barely out of there, on the plane to North Korea, and he starts insulting us. You know, he starts talking about U.S. is insulting Canada. We are not — we, Canada, are not going to be pushed around." "He was talking about the U.S. tariffs," CBS host Margaret Brennan said. Kudlow said, "That's correct. Well, and in general, okay, it was an attack on the president. We are going to have retaliatory tariffs. Now, these are things that the prime minister said before, basically, but he didn't say them before (or) after a successful G7 communique, where President Trump and the others all worked in good faith to put a statement together, which, by the way, almost nobody expected to happen." Trudeau’s threat to retaliate against American tariffs wasn’t news. "The Prime Minister pressed the President to reconsider the U.S. tariffs imposed on Canadian steel and aluminum, and encouraged him to work with Canada to address unfair trade," a Canadian readout of their meeting reads. "The Prime Minister reiterated it is unacceptable to include Canada in 232 national security tariffs."